At the 2018 Sustainability Summit, Sustainable Jersey released the fourth annual New Jersey Sustainable State of the State Summary Report. The annual Summary Reports describe the 57 goals that define a vision of sustainability for New Jersey. Indicators are identified that allow us to track how New Jersey is doing in achieving sustainability goals. Our progress as a state is assessed for each goal. To download the 2018 report, click HERE. To download the 2017 report, click HERE. To download the 2016 report, click HERE. To download the 2015 report, click HERE. This volume contains data, sources and analysis that support the Summary Report. For each indicator identified in the Summary Report, the Technical Report displays the most recent statewide data in chart or table form, lists the resources, and provides relevant interpretation, brief analysis, and in some cases, additional data. The establishment of “Gold,” Sustainable Jersey’s highest level of certification, forgoes the link between the municipal program and the broader, lo ng-term outcomes desired. The roll-out of gold began with energy and waste because they are fundamental dimensions of sustainability for which there are widely accepted metrics of performance supported by readily available quantitative data. 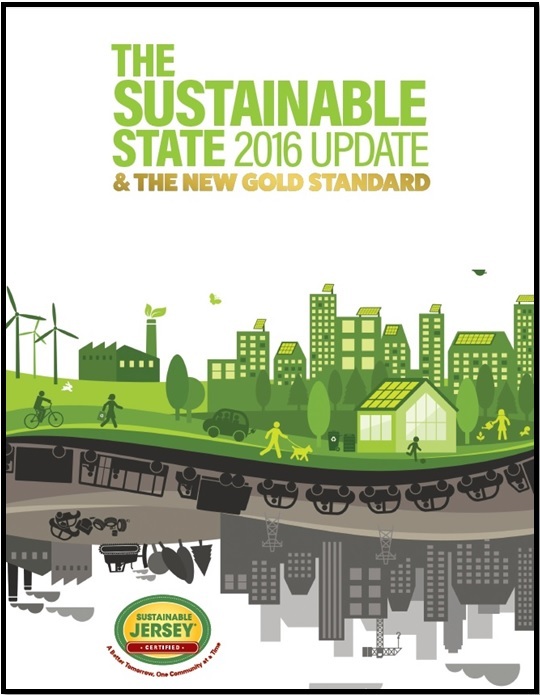 This technical document describes the research that underpins the Sustainable Jersey Gold Star Standard in Energy. This study identifies twelve statewide programs across the U.S. that recognize local governments for achieving voluntary sustainability standards. Certification or other municipal rating systems is generally a signature element of these programs; yet, certification is often merely the most visible form of collective action among many aiming to coordinate priorities, policy, and resources among state and local, public and private actors. Funded by the Surdna Foundation, this study was guided by a working group comprised of representatives of five state-local sustainability programs including: Minnesota GreenStep Cities, Sustainable Maryland, Sustainable Pennsylvania, Wisconsin Green Tier Legacy Communities and Sustainable Jersey. Key personnel from Green Cities California, Clean Energy Communities (CT), the Florida Green Building Coalition, Massachusetts Green Communities, Michigan Green Communities, Climate Smart Communities (NY) and Go Green Virginia also contributed to the report. The New Jersey Energy Flow Model describes the use and flow of energy within the state. This document describes the results and methods used to construct the model that quantifies where all of NJ’s energy comes from, how it is used within different end-use segments, and all the connecting flows. This model provides a framework for quantifying the use of energy within the state at any point, based upon objectively available information. This document provides a technical overview of the NJ Energy Flow Model, as implemented through a spreadsheet and associated visualization infographic (Version 4.5). Please refer to the infographic and spreadsheet for details referenced in this overview. To download the Energy Flow Model technical overview, click HERE. The spreadsheets with data and sources supporting the Energy Flow Model can be found HERE for 2006 and HERE for 2012. This guidebook, developed by Sustainable Jersey and sponsored by the NJ Board of Public Utilities, explains the process from beginning to end in straight forward and easy-to-understand language. Case studies of successfully implemented ESIPs are included and an exhaustive list of resources are also provided to guide local government units successfully through the ESIP process. This project investigates what reductions in greenhouse gas (GHG) emissions are possible in small and medium municipalities. It offers lessons on how to establish a protocol for leadership in municipalities through state and federal support, and to share information on measures that reduce GHG emissions among residents and businesses. To download the report, click HERE. Prepared by the Climate Adaptation Task Force, this summary provides New Jersey communities with a clear picture of the observed trends and projected future changes in the climate system. It also provides an introductory set of planning resources for adapting to climate change impacts.